In preparation for an upcoming workshop on “organization as communication“, I have engaged more deeply with the phenomenon of Anonymous (see also “Anonymous Attacks German Collecting Society GEMA“). Specifically, I am interested in questions such as how to theoretically grasp this online “collective” and how its organizational identity and boundaries are created and (re-)produced. However, as Anonymous grows in terms of activities and supporters, this form of boundary mangement might not be enough any more. 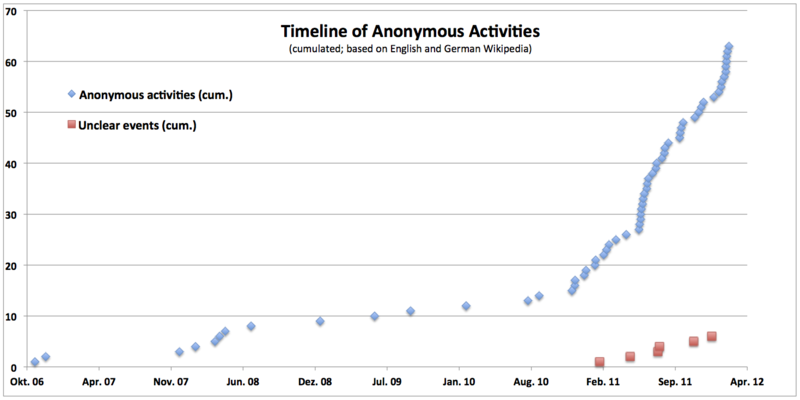 The Figure below depicts the cumulated number of activities ascribed to Anonymous from 2006 to 2012. With the overall level of activity rising, so does the number of contested or unclear events. Of course, Anonymous is an extreme case. But exactly because of its distinctiveness I think there is a lot to learn about organizing practices in general. I will blog more about the case after the workshop next week.